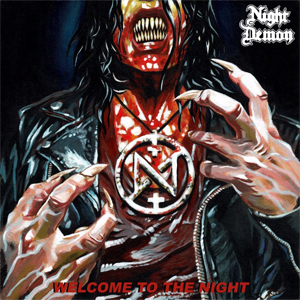 California Metal outfit NIGHT DEMON are pleased to unveil the first offering from the band's upcoming Sophomore record Darkness Remains, which comes in the form of a brand new music video for the track "Welcome To The Night". In addition to the new music video and the band's forthcoming album, NIGHT DEMON have begun a US Tour alongside the mighty ANVIL, which you can find a complete list of dates for below. Check out the video for "Welcome To The Night" on KNAC.COM HERE. Darkness Remains will be available in the following formats: Limited Edition Digipak, LP, and a Deluxe Digital Edition (featuring bonus tracks). The pre-order bundles for Darkness Remains are available HERE. Pre-order Limited CD, Vinyl, T-Shirt Packages at the band's official store HERE. 3.18 - Sanford, FL @ West End Trading Co.